Hope they have a parking plan! This, Red Jet, Reservoir, and Graydon's down the way? Get me a cab! A pity the old Wired Espresso coffee shop that was across the street couldn't make it. Creston has the best neighborhood buildings! There are some small towns that would kill for the urban landscape they have there. Glad to see that things are accelerating. Cool building, cool idea and all. However, I hate to say this but I think I may be starting to suffer a little brewery fatigue. Once each neighborhood gets one. Capacity has been reached. As the colleges grow and younger residents move in. The Breweries become the dive bars of the past. Grand Rapids will see most of these breweries not looking for national distribution, but loyal consistent customers. Exactly. All they are is a newer version of the old neighborhood pub, with most of them having no desire to become the next Founders. There are literally thousands of neighborhood pubs/dive bars in Kent County. 16 or 17 of them happen to make their own beer. Some will probably fail. 4/5's of small businesses fail in the first 5 years. It's just the nature of starting a business. Did anything come from the Planning Commission meeting last week regarding this area? Didn't see any minutes posted. Doubly exactly. How many corner coffee shops want to be the next Starbucks? Or restaurants want to be the next Chipotle? The neighborhood burger/pizza and beer joint. Not Anheuser-Busch. I didn't hear anything and I haven't seen anything online either. Strange. Edit: the parking variance was approved 5-0. WZZM reported the outcome of the planning commission meeting. Most of the story revolved around the LINC development on Eastern. The Creston parking reduction was mentioned in the last sentence of the story. Asheville NC, the city we typically competed with for the title "Beer City USA," has a population of 85,000 and has 12 breweries in the City limits, all are surviving and doing quite well. That's 1 brewery for every 7,000 people. Once all of the breweries in GR that have been announced we will have 13 for 195,000 people. We would need another 14 breweries to catch Asheville. So if Asheville goes and jumps off a bridge, does that mean Grand Rapids should too? I guess I am getting tired of the "saturation" argument when it comes to breweries. No one ever says we are over saturating the market when a new restaurant or pizza joint opens up. As was stated previously in this thread, not all of them are trying to be the next Founders. I'll tell you what we're saturated in, mattress stores. How many of those does this town need? Drive on 28th street from 96 to East Beltline and count them. I'd trade everyone of them for a few more breweries. I stopped in to the Creston Market today, huge upgrade. They are definitely banking on the 616 developments. The have a "wine cellar" and have wine tasting every Friday from 4-7(?). I agree with GRJohn. Every time I see a mattress store I want to torch it. May god have mercy on my soul for saying that. I don't feel that way about breweries. I'll have to wait and see the stats on how many mattress stores Asheville has before I would know if we have too many or not enough. That's exciting. I see that Fat Boy is for sale too. "Everybody talks about a downtown store. This is a downtown store for the downtown community," said Hartline. "It's a seven-minute drive." Nope, a few miles up Plainfield is not DT. But there's a lovely opening at Division & Wealthy where your expansion plans would fit right in. 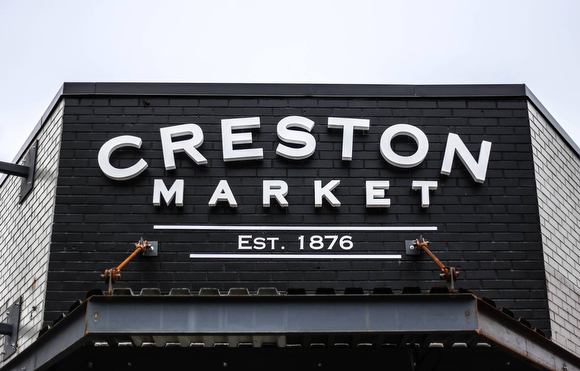 Wow, Creston Market got a makeover. I wish Wealthy Market or Clark's would get bought-out by these guys. This is what we are begging for over here! Couldn't tell from the article - does it have a sit down area? Your best bet would be to go and check it out.